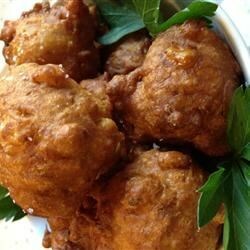 "Delicious corn fritters that can easily be whipped up in an instant. Great with yogurt-mint sauce, or as 'bread' for a tomato, pepper, and basil sandwich." Sift flour and curry powder into medium mixing bowl. Form a well in the flour, and carefully mix in egg, milk, and salt. Mixture should be fairly thin, and may require more milk. Whisk until smooth if any lumps exist. Set aside, and let rest for 10 minutes. Coat the bottom of a heavy frying pan with oil, and heat to medium-high. Stir corn into mixture, and drop batter by the spoonful into pan. Fry fritters until golden brown, about 2 minutes per side. Serve hot or cold.